A can of tuna can often save the day when it’s transformed into a tasty snack or a brunch-type dish such as this. It’s pretty good value for money and it will go quite a long way when you add in a few cooked potatoes. Heat a non-stick frying pan and gently cook the onions in the butter for 3-4 minutes without colouring until soft. Meanwhile, mix the eggs, potatoes, parsley and tuna and season to taste. 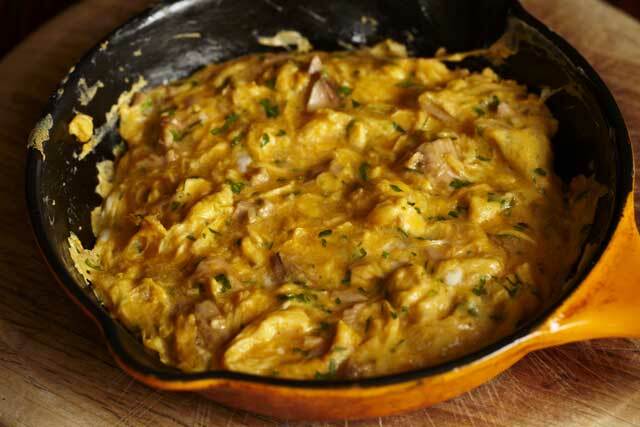 Add the egg mixture to the pan with the onions and stir over a medium heat until the mixture begins to set, then stop stirring and allow the tortilla to set on the bottom without colouring. Remove from the heat and turn out the tortilla on to a plate. Serve hot or cold.